Use the best Jet Card on the market with perks galore, a truly distinctive program of exceptional aircraft available 24 / 7 / 365. 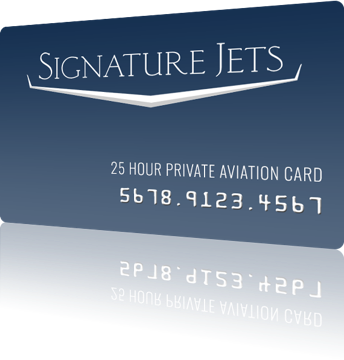 The Signature Jets 25 hour card provides a flexible alternative to owning a jet and fractional jet ownership. Honoring our commitment to uphold the highest standards of safety, service, and reliability unparalleled in the private aviation industry for every customer. Access a comprehensive suite of services including premium charter, concierge, catering, and ground transportation. We believe that every journey you take with us should be an unforgettable experience. That’s why white glove service, comfort, and quality is the standard on each and every flight arranged by Signature Jets. Signature Jets has access to 10,000 aircraft worldwide from helicopters to heavy jets. Browse our aircraft for great pics and interesting stats on each plane featured categorized by light, mid, super-mid, and heavy jets.